thats my first post and also my first scratch build so I'm pretty much a newbie. I built a FT Mini F-22 and it was working great. For different reasons I now wanted to use another ESC and I bought a cheap 30A Simonk ESC from ebay. The problem is that with this ESC I have alot less thrust. My old ESC gave me around 425g of thrust (2300kv Motor with 5030 propeller), the new ESC only 250g. What I noticed is that from around 60% throttle the Motor sounds like a broken engine and won't go any faster up to full throttle. Could this be a desync? I had issues with desync before but this time it sounds different (no screaming, only rattling and rpm slightly fluctuating) and the motor doesn't really stop it just won't go any faster. Why the 30amp esc? 20amp should be just fine with what you are doing. Yes you are right, but I think cheap and I want to build some bigger planes in the future . The old one was 30 amp as well so I thought why not go with the same... Is there any disadvantage at going with a bigger ESC apart from the weight? Possibly. There could be a manufacturing issue that screws with the flow of electricity. Just to confirm a couple of things. The ESC is new, not secondhand? Have you tried adjusting the timing of the ESC? It might be desync-ing even if it doesn't sound that way. The fluctuating RPM you mentioned - I know some ESCs deliberately fluctuate the RPM at high throttle / high current draw when the battery voltage drops below a certain level. Can you check that the bat level is dropping to as you pass 60% throttle and/or check that the low voltage level is set to and what the behavior of the ESC is supposed to be under low voltage conditions? Yes, the ESC is new. I did not know that I could program such things in the ESC . I found a manual online. I will try to programm other timings tomorrow (It's around midnight in germany right now ). Do you know if any of the shown could be the right one? or should I just try all of them until one works? The voltage should be fine. I have a little low voltage beeper in the balance plug and it never beeped (threshhold at 3,7V). 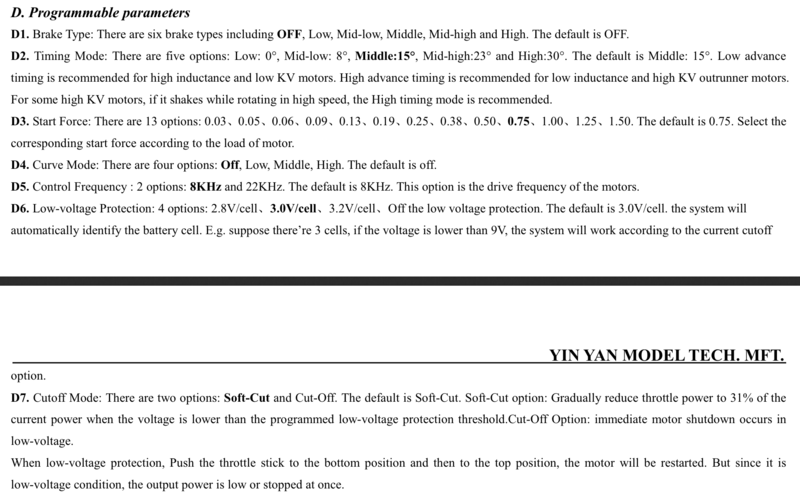 Just for beeing sure that this isn't messing anything up I'll disable low voltage protection in the ESC. I will try to tell you tomorrow if this worked. I tried programming the ESC, but it didn't work. It wasn't possible to get into programming mode. But from reading the ebay description again I saw that this ESC is set to 16khz Motor frequency out of the box. Because standard is 8khz I think this is the problem. I asked the seller how to programm his 'special' version ESCs and hope to get a quick answer. It seems like the seller wont be able to help me with any technical inforamtion. I will send the ESC back, thanks alot for your help!